Some people prefer to stay off the grid and disconnect while traveling and carry nothing more than a camera with them to capture memories. But, I admit it, I Facebook, tweet, pin, stumble, and text my way around my life and around the world. I love social media, and with a love of social media comes a love of technology. Being away for six months at a time also means I need some way of keeping in contact with my family and friends back home. So, what tech do I take with me when I travel long term? I haven’t caught onto the tablet craze yet as I don’t like how slow I type on a touchscreen so I’ve carried a little 10″ Acer Netbook with me the last four years. Sometimes I get frustrated with the small screen size, and it can be awfully slow at times, but it’s better than nothing and allows me to do anything and everything I need on a computer without searching out an internet cafe. 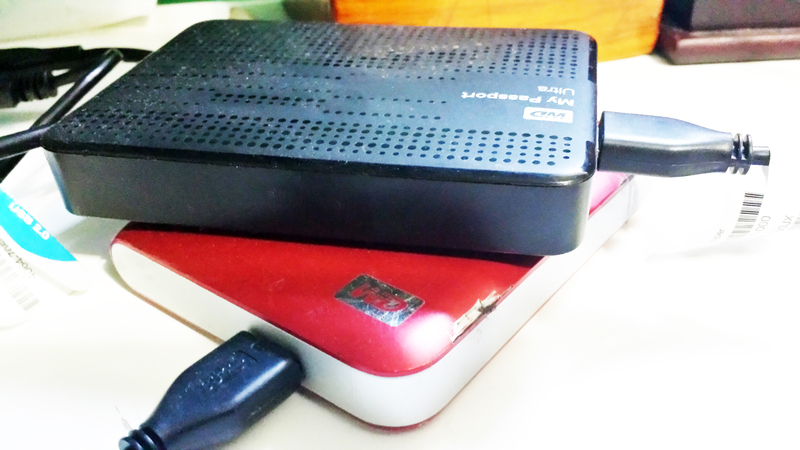 My Netbook allows me to easily keep up with my blog, my photo editing, and my family and friends back at home. An important way to backup my thousands of photos as well as a place to store my plethora of movies I keep for long bus rides, my external hard drive is so important in case my computer gets stolen or dies on me. I have back-ups of back-ups. One way to ensure you don’t lose your important files while traveling. My SLR camera is pretty basic. I carry the two kit lenses that came with it, an 18-55mm and 55-250mm, with a few lens filters and a cheap wide angle and macro lens. I drag this baby with me everywhere; she’s been zip-lining, adventure caving, jungle hiking, mountain climbing, volcano trekking and to more restaurants, town squares, and bus rides than you can count. I paid a pretty penny for this camera and although I don’t want anything to happen to it, there’s no sense missing a shot of that unreal moment because you were too scared to bring it along. I double my camera case as my purse and mini day pack to also make it more manageable when I travel. 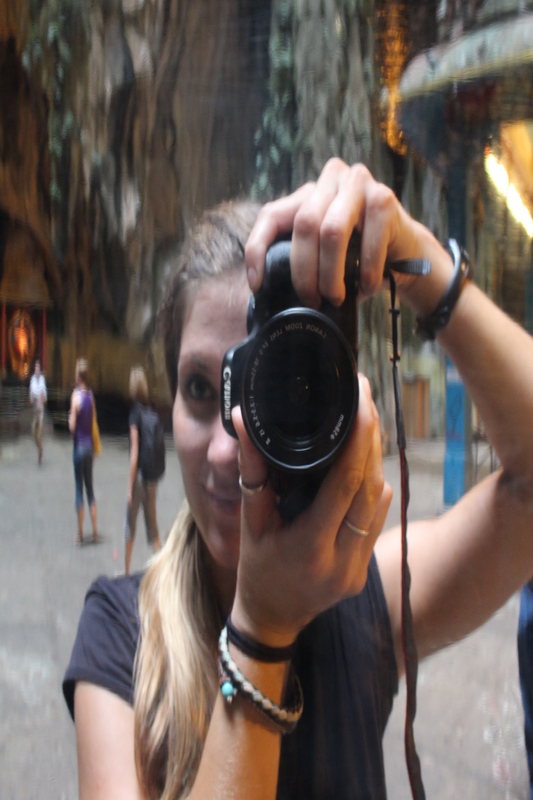 Snapping a reflected selfie with my Canon 600D. My phones have been different every trip, ranging from a basic Samsung, to a Blackberry, to an older version of the Galaxy. The S4 I currently own and use when back in Canada is amazing and I love it. It has a large screen and apps for everything you need. It’s unlocked so I can use it with a local Sim card in any country and it has slowly started to replace my computer in several ways on the road as it makes updating social media much easier while on the go. 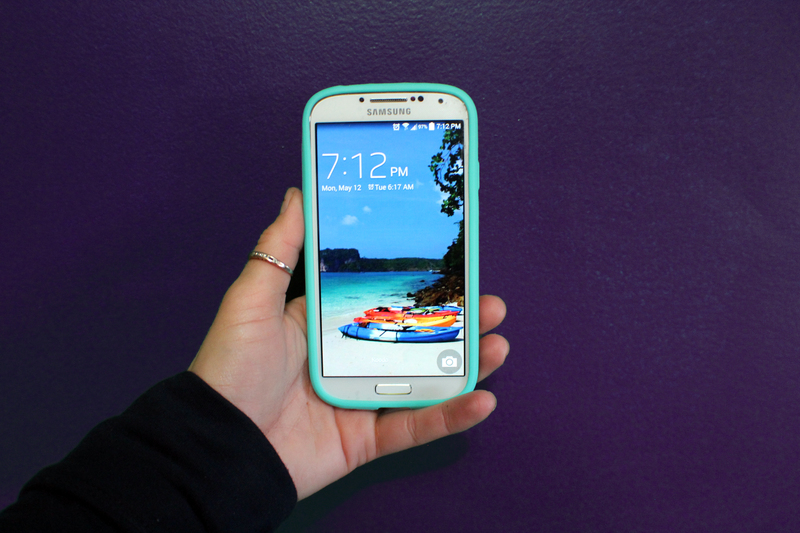 Multi-functional Galaxy S4, my life in my hand. 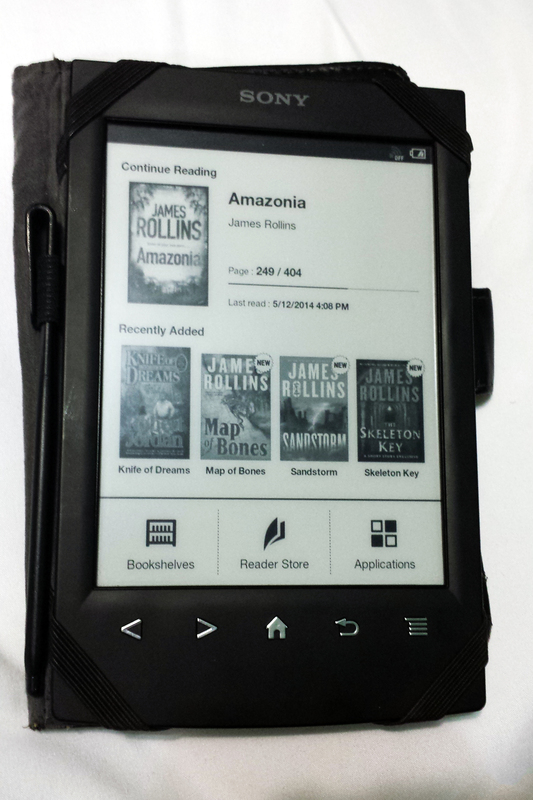 Since I’m such an avid reader, I had to purchase myself an eReader. I thought they were silly at first and a waste of money until I tried one. It’s small, thin, lightweight and you can put thousands of books onto it so you never need to read something you just picked up in a hostel. You can also put a .pdf version of your guidebook on it so you don’t have to lug that around in your daypack. 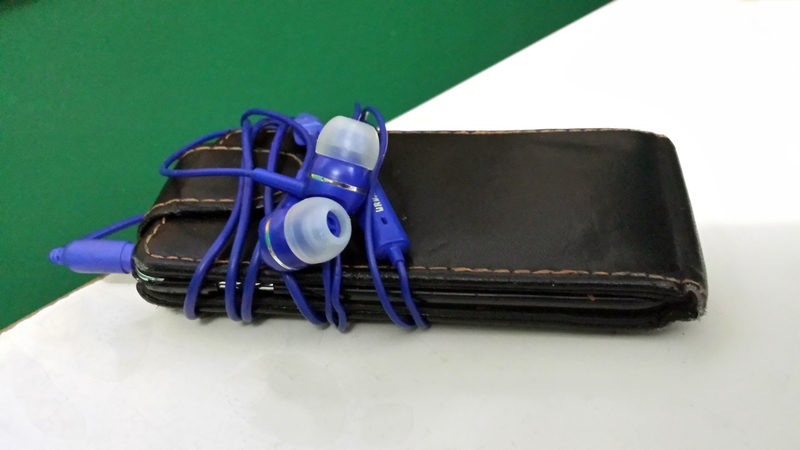 I’m not much for music, but I love to listen to audiobooks when I work out, clean, on long bus rides, and anytime I can multitask. On those 24 hour plus bus rides, an audiobook is perfect to listen to while you watch the amazing scenery go by. Plus I use a specific app on the iPod to track all my money while I travel. 4th Generation iPod Touch, ready to go with my headphones. 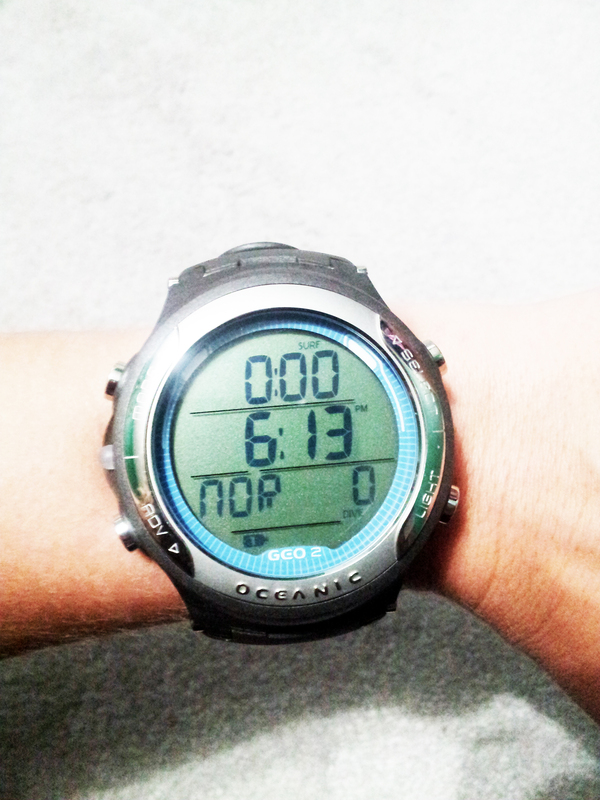 I purchased a dive watch since I’ve become such an avid scuba diver. I managed to get this for a nice price at a dive shop’s anniversary sale and it works flawlessly, tracking my dive profile underwater and surface interval. It can be used with different combinations of air as well (nitrox, tri-mix). It also comes with an incredibly expensive cable for transferring the data to my computer that I carry with me as well. Another purchase as a result of my diving obsession is a pretty basic point-and-shoot camera that can be placed into a plastic underwater housing case that allows me to take photos up to 40m underwater. I bought this second hand and the camera is a few years old and doesn’t even shoot in HD but it’s so worth it for those magical underwater moments. It’s also a double bonus, because sometimes I don’t want to take my DSLR with me (bars, white water rafting etc.) so I can bring this little one along and slip it into my pocket or into a water proof baggie so it doesn’t get wet and still capture those important moments in my trip. 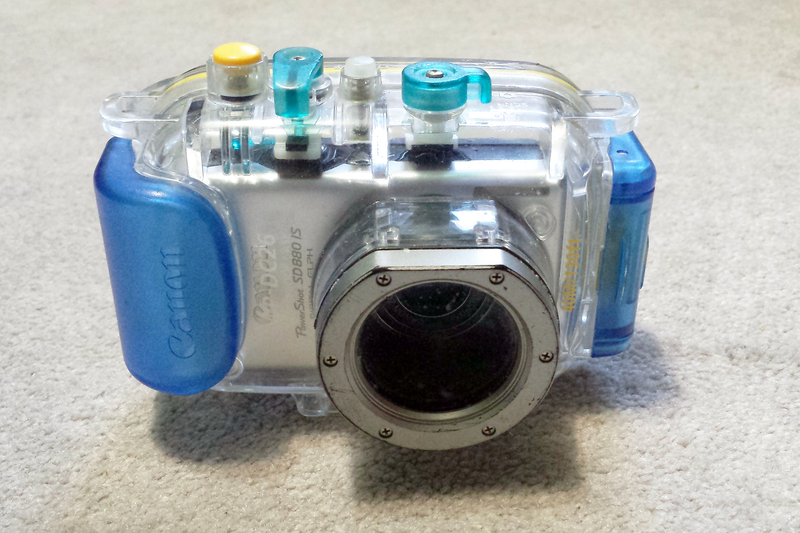 The underwater housing with a Canon SD 880 IS inside. *I’m hoping to upgrade to a GoPro for my next trip which will be more versatile, smaller, and lighter. 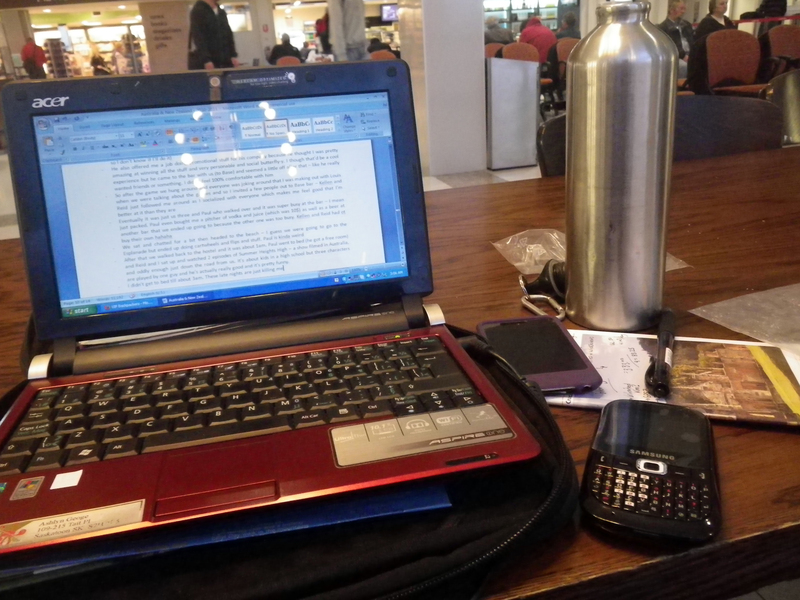 Although I happen to carry a lot of different tech items, you don’t need to take all this with you. Many people I meet tend to only carry their smartphone with them and that’s just fine. Take what works best for you and what you will need to get by while traveling around the world. One thing I would recommend is to consider taking some form of memory backup, whether it be an external hard drive, an extra memory card, or a USB stick. Internet isn’t always reliable to upload photos to a cloud and you’ll be thankful to have that backup in case you ever have your camera or phone stolen.